We're now starting to carry a line of exclusive post cards. Mostly done by our own staff. A sample follows. 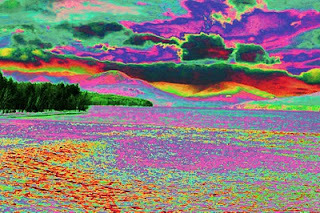 It's "New York's Psychadelic Reservoir." The shot was taken by David (the owner) and then edited to give it the counter culture look. The resevoir in the picture is really the Ashokan Reservoir, which is part of New York City's water system -- located in Ulster County New York (just as we are).